The American Robin is one of the most commonly seen birds in America . They are also the friendliest birds that you will ever encounter. They are the first bird to greet the new day with a song, and usually the last to bid it goodnight. Their song is a wonderful musical whistle sounding like “cheerily, cheer up, cheer up, cheerily, cheer up” which seems to encapsulate their philosophy on life. This two bedroom cabin is perfect for friends or small families. The Robin’s Nest Cabin is full of cheery country charm. As you enter Robin’s Nest you’ll be greeted with the cozy and comfortable, country style living area accented with the wood burning fireplace. The kitchen features a service bar that provides the chef in the group with the ease of “dishing” out the “vittles” while still being able to watching the ball game from the kitchen. The covered porch is perfect for relaxing or cooking a meal on the large charcoal grill. An awesome part of Robin's Nest Cabin is the enclosed hot tub deck! The grounds around Robin's Nest are a perfect little woodland getaway. A fire pit is off to the side of the cabin for roasting marshmallows and telling Bigfoot stories! Robin’s Nest Cabin is a perfect two bedroom woodland hideaway. Robin's Nest is a wonderful woodland getaway offering tons of charm and a relaxing atmosphere. There is a flat screen TV located in the living room with cable access and a DVD player. The deck offers a great place to relax and enjoy a meal outdoors and the hot tub gazebo deck is the perfect private hideaway. Located in the Pinyon road area which is on the west side of the dam/spillway/trout fishing area. Robins Nest Cabin is located in an area with other cabins. (Please click to view map)There is limited privacy at the cabin. The area is surrounded by trees. This cabin is not secluded. There are a lot of trees in this area. Robin’s Nest sister cabin is Little Rainbow. They are approximately 25 feet apart. Boat and Trailer parking is available and accessible for boats and trailers of all sizes. The road to Robins Nest is a dirt/gravel road. 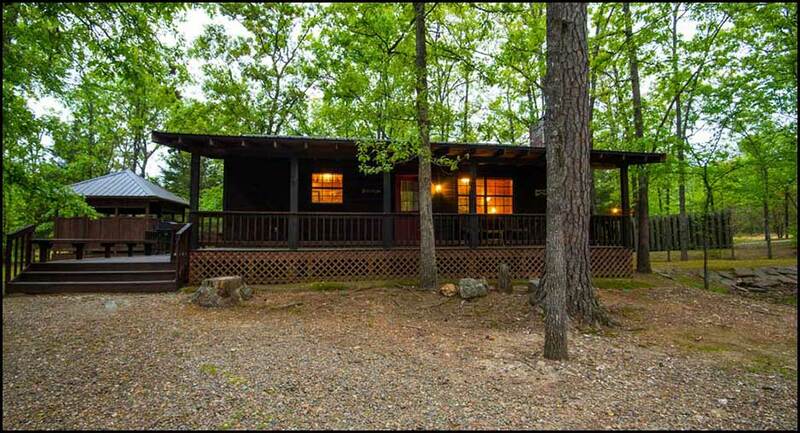 Located approximately two miles west off of Hwy 259 – you will not hear highway noise from this cabin.